There are plenty of unique games that you are going to find online, no matter what type of gambling site you decide to play at, however one category of game that you may never have played before, that may just be of interest to you are the virtual sports games. Those games can take the shape of a horse race, boxing match, soccer match or even a car racing game, in fact the list of sports they can be and are based around is almost endless. The one main different obviously between virtual sports and real-life sporting events, is that each virtual sports game you will come across uses a random number generator to determine the outcome and the sporting event is shown using computer graphics as opposed to real soccer players, horses, cars, boxers and the so on! 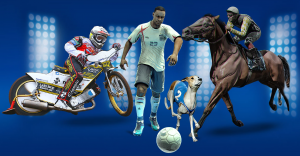 All the usual bets and wagers you can place on the real-life sporting events the virtual sports games represent can be placed on the virtual version of those games, and you will find you can place small or high valued bets too. Once the scheduled starting time of any virtual sports event has been reached, then the random number generator controlling that game will then choose to winning outcome, and in the case of a virtual horse race for example the computer-generated graphics will then show the race being run and the horses will then finish in the order predicted by the random number generator. Therefore, it is possible that any of the possible outcomes on any virtual sports event can be the one chose by the RNG, and as such that is why a lot of players and punters do enjoy playing those types of games online or in land-based betting shops, as their horses cannot fall at a fence for example! If you do fancy playing any of the many different types of virtual sports games, then there is no shortage of them online and every couple of minutes a new event will begin. Whilst these types of games are no substitute for the real sporting events and sporting fixture they replicate, if you have been planning on having a bet on a soccer team, boxer or horse today, and the event has ben abandoned or rescheduled due to the weather for example, then you are also going to find virtual sports betting fun and just as exciting. If fact, from what I have seen, many gambling sites will have a special section of their website dedicated to virtual sports, and many of those sites are also going to be giving away exclusive bonuses to players and their customers who make a deposit and play those games. So, do always consider giving some virtual sports games a little bit of play time, if for example you are logged into a casino site and you fancy something of a change of pace if things have not been going your way at the cyber gaming tables, slots or on the video poker games!